Hats off to everyone who has managed to get their novel written this month. Especially if you’ve had to fit it around work, children, aged parents, ill pets, whatever. What a ride, eh? But by golly my first draft’s even more of a mess than usual this year. Before I take another step I need to sit down and get to grips with the structure and plot. I’m giving the marvellous Julie Cohen post-it method a whirl this time. I went stationery shopping and got the supplies in earlier today, and my shed looks a little like a nursery school. I’ve already filled my big pieces of card and the post-its are crawling around the walls now in a rainbow trail of scrawl that is unintelligible to everyone except me (for whom it is incredibly useful). In other news: I have delivered the amended page proofs of Every Vow You Break to Headline. Next step is the printed proofs, which Headline produce to look very like a finished book. In the next couple of days, I’m going to be able to exclusively reveal the cover design. It’s very lovely, quite unsettling and captures the world of the novel perfectly. Very exciting! 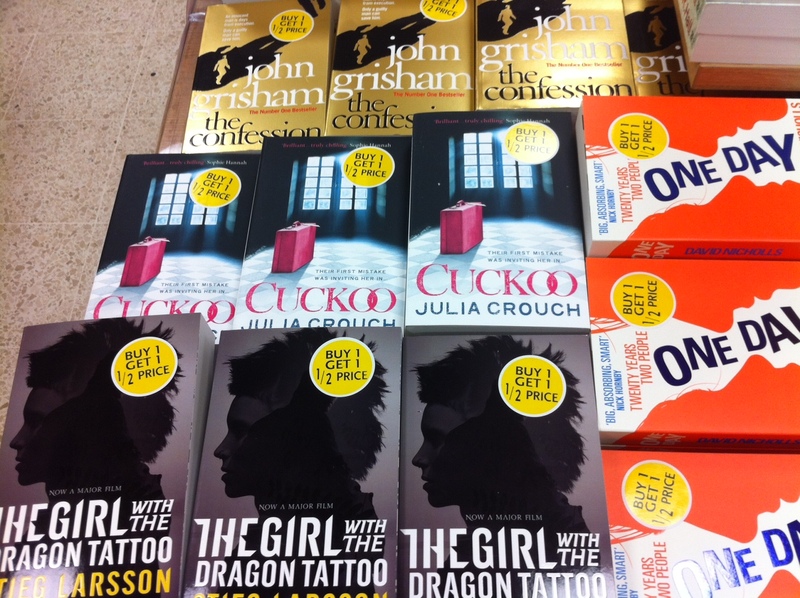 Most marvellous is the publication of the mass market paperback edition of CUCKOO, which is in the shops now. As you can see above, it is keeping very good company, out on the tables in WH Smith. BigSon saw someone reading it on a train the other day. That’s my fantasy come true! I do like speaking at libraries – every event I have done has been really well attended by people who are passionate about books. I particularly like the questions that come up – there’s something about the informality of the library setting that makes for great discussion. More library gigs please! Next → Next post: Is this a Novel? So nice to hear you have been very busy. Nearing the end of Cuckoo and at that ‘can’t wait for the end but don’t want it to end’ quandary. I had a life before I started reading this book. Most exciting read of the year for me.